DO YOU LIKE TO KNOW THE TEMPERATURE VALUES AND THE RAIN RATE FOR ROME AND OTHER ITALIAN TOWNS? Meteorology: rain, snow,wind, temperature, pressure, etc. The above data will be sent, on request, by electronic post. 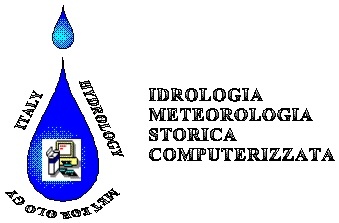 The present Study activity contains the historic cartography research, starting from the year 1000, from which it is possible to redefine in the computer the environmental evolution, with the aim of setting some territorial organization programs. If desired, the data of interest could be integrated with those derived from the teledetected images from satellites and/or aircraft platform. The same methodology is followed to acquire data about environmental variations and about the damage caused by natural events of catastrophic entity, like floods, dry periods and icing of water bodies. In the followings are described some of these diagrams, given by this Study and concerning the elaboration of thermal and rainfall data over tens of years, coming from the Brera meteorological observatory in Milan.